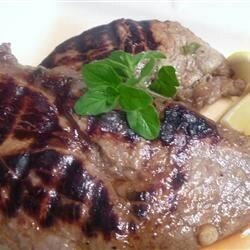 "Impressive dish with an inexpensive meat. Before plating, squeeze a small amount of lemon juice over meat and garnish with sliced lemons if desired." Prick the London broil on both sides several times with a fork; place into a resealable plastic bag. Whisk together the lemon zest, lemon juice, olive oil, sugar, green onions, Worcestershire sauce, Dijon mustard, salt, and black pepper in a bowl. Pour into the bag with the meat, coat with the marinade, squeeze out excess air, and seal. Marinate in the refrigerator at least 3 to 4 hours, but overnight is best. Remove the beef from the marinade, and shake off excess. Discard the remaining marinade. Cook the beef until it is beginning to firm, and is hot and slightly pink in the center, about 17 to 20 minutes per side. An instant-read thermometer inserted into the center should read 140 degrees F (60 degrees C). Cover the meat with two layers of aluminum foil, and allow to rest in a warm area for 10 minutes before slicing thinly across the grain.